Is the Enterprise Plan Right for You? As part of a larger sales team, it’s important to know that your time and effort are being used as efficiently as possible. Yesware’s Enterprise tier includes all the tools you need to close deals faster: unlimited tracking events, an unlimited number of teams with advanced reporting, centralized template libraries, and an unlimited number of events using our integration with Salesforce. With the Enterprise plan, you’ll gain unprecedented insight into the efficacy of your emails while being able to focus on selling instead of being bogged down by manual CRM data entry. Yesware’s Enterprise plan makes it easy to build and maintain relationships with your prospects and customers! Tracking is at the core of Yesware and gives you immediate feedback on the effectiveness of your message. When you use tracking, you’ll be notified in real time when your prospect opens your message or clicks on a link within the message to find out more about your product. The Enterprise plan will make sure that you have an unlimited supply of these notifications so you’re always gaining insight about the people you communicate with. Yesware’s presentation tracking feature gives you valuable insight into how engaged your audience is with your content. We’ll provide you with a presentation report which shows who viewed your presentation, how long they spent on each page and how often they accessed it. With Yesware’s Mail Merge, you can quickly send personalized emails to up to 200 recipients at once. You can schedule mail merges and automated follow ups for up to 3 months in advance. Yesware’s Mail Merge streamlines your email outreach process by merging templates with information customized to each recipient, such as names, company, dates, etc. Don’t waste time manually updating Salesforce – spend your time closing deals instead. Yesware’s Enterprise edition makes it easy to keep Salesforce up to date. Every time you send a message and every time someone interacts with your message by opening it, clicking a link in it, replying to it, or opening your attachment, a new task will automatically be created in Salesforce for that contact or lead! The Enterprise edition doesn’t limit the number of these events, so you’re able to always be on top of every contact, documenting every correspondence with them! Salesforce integration goes deeper than your emails – using Yesware now syncs your Google Calendar events directly to Salesforce and associates them with the contact or lead you’re meeting with. In addition, any events that you create in Salesforce will automatically be added to your Google Calendar. This means less manual data entry, better teamwork for appointment setting, and even mobile support for saving events from the road! We sync your newly-created events (and event updates) within a matter of minutes – no more calendar confusion! If you’re creating your events in Google Calendar, you’ll be able to choose your contact or lead and account or opportunity while creating the event and we’ll add an activity in Salesforce for you automatically. In addition, you’ll be able to sync calendar events to Salesforce from any device – including mobile! We also support recurring meeting sync to Salesforce for Enterprise users. Simply open the event in Google Calendar and check the box next to “Sync Calendar Event to Salesforce” to eliminate that extra step from your weekly routine. No more switching back and forth between Salesforce and Gmail – Yesware brings the two together! The Salesforce sidebar displays your history with your contact while you’re viewing an email. Each one of the tasks in your activity history is clickable and will bring you right to the Salesforce page with full details of said activity. Not only can you see your history with your contact, but you can also create new tasks directly from our sidebar. Whether you use tasks to add a quick note about your most recent email from your prospect or remind yourself to follow up with them, Yesware helps you stay organized and efficient. Our Enterprise plan is an ideal solution for large sales teams that want to streamline their email communications and gain insight into team activities. You can create an unlimited number of teams with unlimited members and leaders, review and share effective templates, and get advanced reporting on all team activities. Unlike the Free or Pro plans, the Enterprise edition of Yesware lets you see full detailed performance for your team as a whole as well as for individual users. We’ve designed the Team Tracking Report, Activity Report, and Prospects Report to make team management easier for everyone. 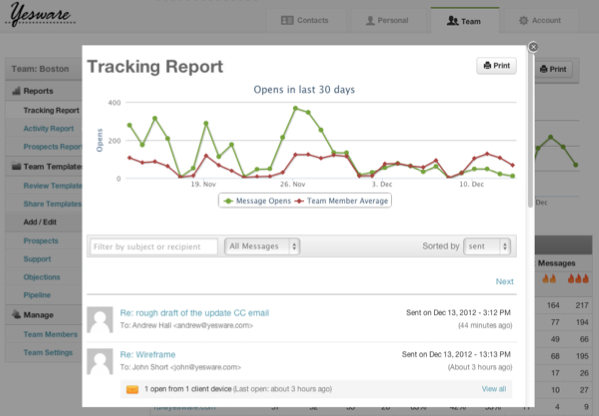 The Team Tracking Report details your team’s performance, member by member, in an easy-to-read graph with details including emails sent, emails tracked, and open / reply statistics. The Activity Report provides an overview of template use, tracked emails, and CRM usage by team member. The Prospects Report aggregates each user’s Prospects into a single place, allowing team leaders to monitor overall team progress. For all of these reports, you’ll be able to click on any user on your team to drill down on their details – filter, sort, and review their individual performance. Yesware Enterprise edition makes it easy for members of a sales team to collaborate. When you first sign up for Yesware, we’ll take any standardized emails that your team uses and share those out to each member for you. Over time, you might find that one member of the team has a really effective template that the whole team should be using. Your team will have a centralized template library where you can keep your most effective templates and easily share out to each member – no more version confusion or manual sharing! Think the Enterprise plan is the right plan for you? Head over to our plan overview page to get started. Need more information before making a decision? Send our sales team a quick note or call us at 855-YESWARE.